The Truth About Music » Am I The Only Person Worried About Star Trek Seeping Into Star Wars? Am I The Only Person Worried About Star Trek Seeping Into Star Wars? Last night I was out at a bar having the type of conversation that all but guarantees there won’t be an attractive person within earshot. It was full of words like ‘X-Wing,’ ‘lightsaber,’ and of course ‘Millennium Falcon.’ Needless to say, the entire bar went about their business while me and my fellow nerds debated the merits of the new Star Wars trailer. Since it was announced that J.J. Abrams would direct Star Wars Episode VII: The Force Awakens, I’ve been worried. It’s not that I don’t trust Abrams to bring Star Wars into the next decade. In fact, I have a lot of faith that Abrams will do a fantastic job with the franchise. What worries me is that Abrams is coming off directing two movies that happen to not online fall into the same genre, but for casual fans, are one in the same. There was only one shot in the trailer that brought this to mind and unfortunately it was the key sequence. 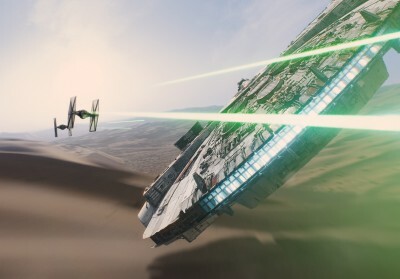 Tell me I’m not the only one that thought the Millennium Falcon’s awesome upside down spinning shot, looked an awful lot like it belonged in one of Abrams Star Trek films. Ok nerds, I already hear you bitching. “The USS Enterprise could never perform that complex move so close to the ground.” I get it! Take a deep breathe and think about the big picture. It’s not about the action of the scene but about the way that the scene was filmed (or animated). Who am I to judge? We’ve only been witness to a single trailer that lasts just over a minute-and-a-half. Point is, I love Star Wars and I love Star Trek. I’m worried that two of my favorite all-time franchises are about to meld together in a way that only the overuse of lens flare can produce. The conversation at the bar peaked last night when we discussed the voice in the trailer for The Force Awakens. While many believed it to be none other than Khan himself, Mr. Benedict Cumberbatch, it’s actually the voice of Andy Serkis who voiced Gollum in a different all time series (Lord of the Rings). That led to thoughts of Chris Pine as Han Solo’s son or Zachary Quinto playing Spock. Wait, what’s Spock doing in a Star Wars movie? One answer, worm holes. This absurdity is just that. It’s not like we’re going to have actors crossing the boundary between Wars and Trek, but Abrams involvement in both franchises just feels weird. Imagine Christopher Nolan directing both the Batman and Avengers series’. Besides being absurdly wealthy, Nolan would have too much power in guiding the fictional fates of characters that millions of people grew up with. Finally, there is another man who finds himself at the cross-hairs between Star Wars and Star Trek. That is cinematographer Daniel Mindel who worked on both Star Trek movies under Abrams and who will now help him create the long lost worlds of the Star Wars universe. Once again, it concerns me that not only will Abrams be directing Star Wars, less than two years after Star Trek: Into Darkness was released, but his cinematographer will once again be Mindel. So here we are. We’re one year away from the release of what will undoubtedly be the most anticipated movie in the history of movies, directed by a man who has proven he can take older franchises and make them relevant in the 21st Century. 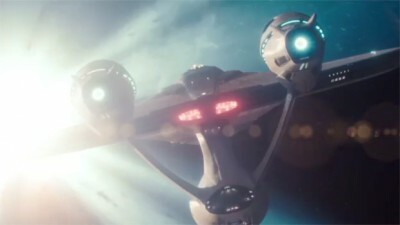 I hope that Abrams is able to do enough to make Star Wars different from Star Trek. Either way, I’ll be online at midnight one year from now. Here’s a holiday toast to Abrams and praying to the Comic Con gods (I assume Thor and Obi-Wan Kenobi are among them) that Star Wars: The Force Awakens is as awesome as the trailer and that Star Trek and Star Wars, don’t become one in the same for the next generation of fans scaring people away at the bar with nerd talk.